There are two great football games on the market this week. Most fans will only buy one. It's a tough call. Alone amongst major sporting series, the battle between FIFA and Pro Evo is actually a pretty fair fight. Both games present compelling arguments as to which is the better football game, depending on who you are and what you're looking to get out of your game. Given this unique situation, I thought rather than reviewing both games individually and simply preach to the converted, I'd throw them in the ring and see how they trade blows. Below, I'll be listing each thing I think one game does better than the other. If something isn't mentioned, assume it's roughly equivalent. Hopefully you can pick through it all and, knowing what you prefer in your football game, choose the one that's right for you. Licenses - Perhaps a little unfair, given this is a business decision, but it's still a significant feather in FIFA's cap. FIFA 13 lets you play in the Barclay's Premier League as Arsenal. In Pro Evo, you play in the English League as North London. Sure, Konami balance this out with some licensed tournaments, like the Champion's League, but the number of official leagues FIFA 13 boasts more than outweighs this. Animation & Handling - Where Pro Evo 2013's players still move and receive the ball like they've been carved by Geppetto, FIFA 13's players have a fluidity and grace unmatched in all of sports gaming. It's one of the first things you notice when switching between the games (as I have all week), and given the importance of movement and touch is also one of the most critical. Online Play - It's not even a contest. FIFA 13 has so many online modes tucked away in its EA Sports FC, from seasons to one-offs to challenges, that you can see why millions of people buy this game solely for the multiplayer. My favourite are the new games tied to real-world events, where you can pick any team and play one of their recent (or upcoming) fixtures with the actual squads, injuries and even player form carrying over from reality into FIFA 13. Commentary - Again, no contest. There's plenty of recycled content in there, but in terms of fluidity, relevance and overall entertainment value, FIFA shouts all over Pro Evo's embarrassingly bare-bones efforts. A nice added touch this year are constant crosses to sideline reporters and audible updates from concurrent games. Tutorial - My God. Where did this come from. Pro Evo used to have the upper hand here, with its training mode, but FIFA has swept in and given us not just the best tutorial in sports, but maybe the best tutorial system in all of gaming. How? You get little mini-game challenges to play while an actual game is loading. Yes, instead of staring at a loading screen (or blindly shooting as in previous FIFAs), you can continually learn things and improve your game, every time, and not just to learn, but to play for points. It's genius. Role-Playing - Both games have the expected "be a pro" mode, where you assume the role of a single player on a team, but where FIFA's is still frustratingly ambivalent, Pro Evo's would be a viable purchase as a standalone game. I'm serious. The challenge of rising through the ranks is scaled just right, you're given constant feedback on your progress, there's the ability to assign custom training regimes, and you even have chats with your agent once a week. There's so much depth there it's easy to forget the rest of the game even exists. Space - I don't know whether Pro Evo's field is bigger or its players smaller, but Konami's game more accurately portrays the amount of space you have to move on a football field. FIFA always feels a little cramped for my liking, while Pro Evo feels like I've got plenty of space to move and pass (and bigger goals to aim at as well). It's Smarter - FIFA may look sharper with its fancy effects and official kits, but Pro Evo's AI still plays the smarter game of football, especially in the attacking third of the pitch. The computer's players make better attacking runs and are more patient defenders, leading to more calculated and realistic affairs than FIFA's emphasis on speed and attacking play. Human Beings - They may not animate as smoothly as FIFA's players, but the men populating Konami's game look a lot more like professional footballers than EA's often disproportionate cartoon blimp people. Like I said, hopefully you can pick through that and sort out which of the two is more suited to you. If for some godforsaken reason you need me to act as a tie-breaker, though, I'm going to go with FIFA. Just. Konami deserve a drink or three for the work they've done on Pro Evo this year. After a succession of lacklustre games this console generation, the series was probably one or two years from oblivion, but wholesale improvements across the board, particularly in areas more serious football fans will tinker with, mean it's once again a credible competitor. Indeed for many, aforementioned serious fans in particular, it'll be the superior product. But for me, it still doesn't have the mustard to get past FIFA. EA's product is simply too slick, too smooth and overall too well-rounded to not come out on top. It's got by far the stronger online component, its production values and licenses make it a more "authentic" broadcast experience and while it's not without its problems on the pitch, it still plays a great, flowing game of football. Good news for EA, then, but in the grand scheme of things better news for Konami and, more importantly, you, the consumer. Stronger competition between these games is exactly what the genre needs to drive innovation and keep each series on its toes, so with Pro Evo quite literally back in the game, we'll hopefully be in for some great football titles in the next few years. 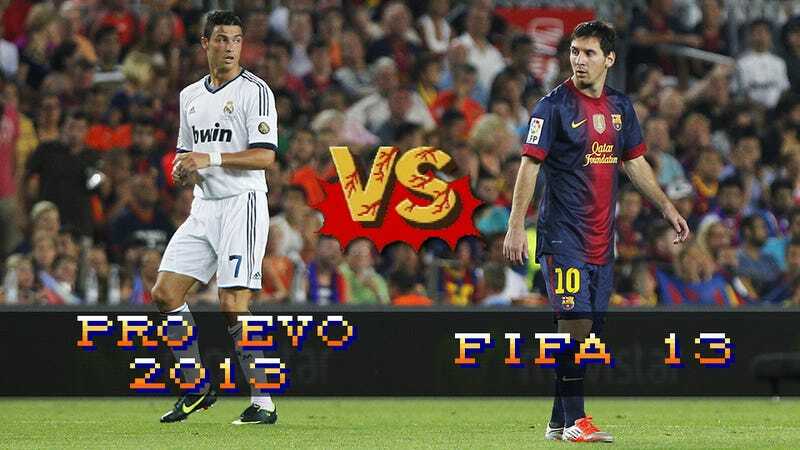 NOTE: FIFA 13 played on PS3, Pro Evo 2013 on Xbox 360. If you've got any more specific questions, leave them below and I'll do my best to answer them!